Dr. Dulat graduated from University of Manitoba's Faculty of Dentistry and has been in private practice since then. He is a man who believes that his dental degree was only the beginning of his education as he actively seeks to keep himself abreast with the latest in the field. Looking for comfortable, confident and convenient care from dentists in Winnipeg? You've come to the right place. 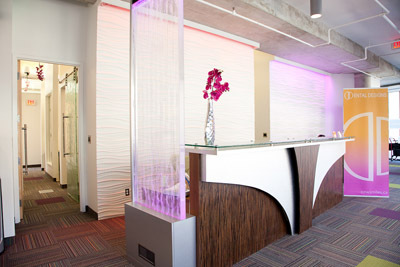 From the minute you walk into our office you will notice a difference at Dental Designs. We care about you, your family and your friends, and we're here to help you achieve your healthiest, brightest smile. At Dental Designs we know every person's dental needs are unique. That's why we offer a comprehensive selection of treatment options in a comfortable, convenient atmosphere. We're confident we can provide superior dental care that no other dentist in Winnipeg can offer. We specialize in improving smiles. Our practice offers optimal orthodontic treatment and appliances, including traditional braces and Invisalign aligners. Learn more about the orthodontic process, which includes an x-ray and teeth impression to develop a plan for you. Restore your bright, healthy smile with a high quality dental implant procedure. Implant dentistry is the major method to replacing a tooth or multiple teeth. Find out more about dental implants in Winnipeg and the steps involved. An alternative to traditional, metal braces. Invisalign® aligners include improved features, especially for teenagers. Learn more to find out if Invisalign® treatment is right for you. Temporomandibulat joint defines TMJ treatment. This includes treatment for pain and dysfunction of the jaw joint. Read about the signs, symptoms, and causes of jaw joint & muscle pain, and TMJ through our TMJ treatment page. We've developed this informational website as an extension of our practice, to serve as a convenient, educational resource for our patients. With just a few clicks, you can find helpful information about our services, credentials and office policies. You can also easily access patient forms or request an appointment with our Winnipeg dentist. Discover a new dental experience at Dental Designs! We look forward to caring for you and your family's dental needs.